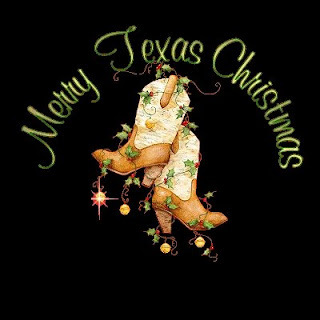 I've also put together an hour and a half of other Texas Christmas music for our Troops click here! Brian Lumley - "Oh Holy Night" / Jesse and Noah - "I Want Texas For Christmas"
Mario Flores - "Hard Candy Christmas" / Scooter Brown - "A Soldier's Christmas Eve"
Tommy Joe Wilson - "Overdrawn Over Christmas" / Troy Anderson - "Christmas In Texas"
Way out on the prairie, without any snow. A dreamin' of Christmas, like me and you. There came such a ruckus, it gave me a fright. The horses (not reindeer) he drove with such skill. There'll be plenty of travelin' for you all tonight." Had a ten-gallon Stetson on top of his head. With his beard and mustache, so curly and white. And were so astonished, that neither one spoke. That neither could think of a single thing more. He asked in a whisper, "Are you really Santa Claus?" "Am I the real Santa? Well, what do you think?" And he smiled as he gave a mysterious wink. "To all the children in Texas, Merry Christmas, You-all"
"I WANT TEXAS FOR CHRISTMAS"